Vogue takes the cake when it comes to the September issues. 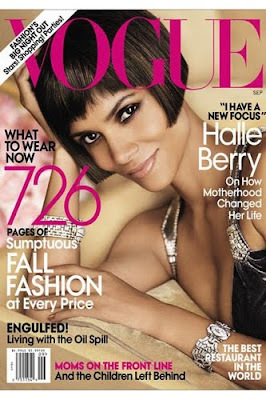 Clocking in at 726 pages (yes, more than half are ads, albeit gorgeous ones), this issue features a play by play of Fashion's Night Out and an interview with cover girl Halle Berry. Anyone else obsessed with the the Olson twins' fashion lines The Row and Elizabeth and James? The September issue of Marie Claire includes a candid interview with Mary-Kate Olson and an inside look at model-turned-designer Jessica Stam's collection for RACHEL Rachel Roy. My roommates and I saw Eat, Pray, Love last week and although I was skeptical at first, I really enjoyed it. The film's star, Julia Roberts, appears on the cover of the September issue of Elle. 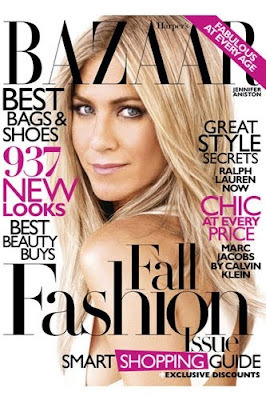 I have already blogged about the spread depicting Rachel Zoe dying in the name of fashion in the September issue of Harper's Bazaar here, and I can't wait to see the rest of the issue, including the Jennifer Aniston editorial. I look forward to receiving my wave of new magazines each month, but there is definitely something special about the September issues. I am starting to receive them in the mail and perfect beach weather plus an upcoming cross country flight provide the perfect opportunity to give each issue my full attention. Which cover is our favorite? 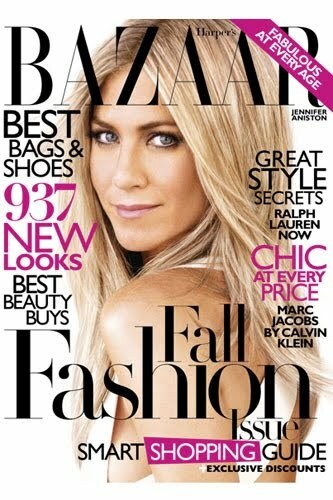 Jen Aniston can sell me almost anything, I heart her so much, and I'm loving the breezy color scheme of the Marie Claire cover. But, of course, one cannot deny the reign of the Vogue September issue. I am so looking forward to it! hands-down Jen takes the cake*, shes stunning... but the Vogue September issue is quite the adventure while reading.